Like always, when we're talking about ToneBenders, we can't forget to mention Vox. 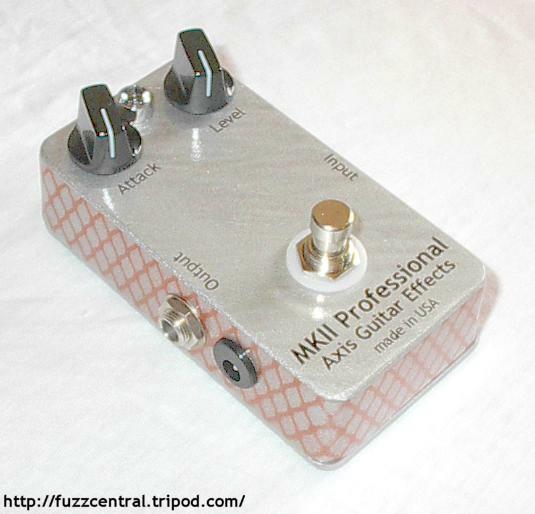 Vox also made a version of the ToneBender MKII Professional which they also called the MKII. It was the same basic circuit with only a few minor component value differences. Check out the schematic of the Vox MKII below, which was emailed to me by Peter, who traced the schematic from an original he owned. As part of a recent trend of "retro" effects pedals becoming very popular again, Sola Sound reissued the ToneBender MKII Professional... sort of. 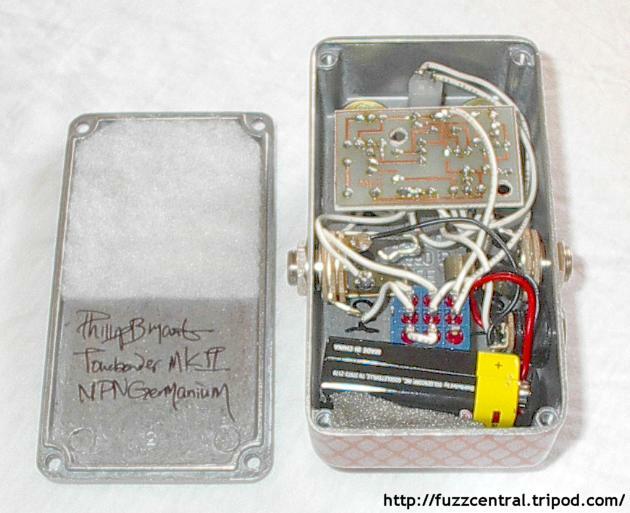 The pedal wasn't equipped with the original three-transistor MKII circuit, but rather a modified version of the Fuzz Face. 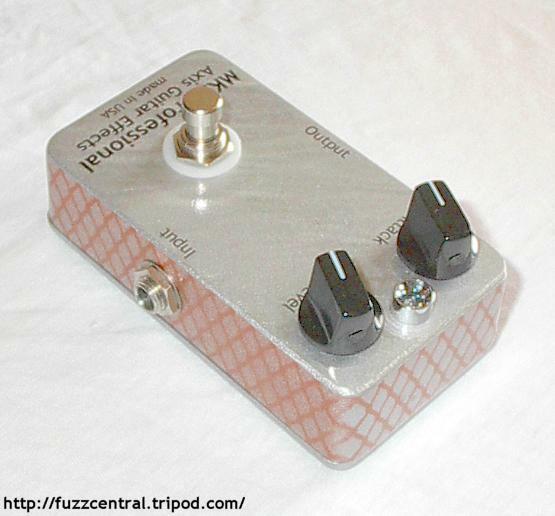 If you take a look at the schematic of the MKII reissue pedal below, you'll see that there have been a couple of changes and add-ons to the Fuzz Face circuit. The two most notable additions are the 220pF and 10pF capacitors that are across the collector-base of Q1 and Q2 respectively. These two added capacitors help to smooth out the sound of the pedal, as well as to remove some high-end from the circuit. The input capacitor has been increased from 2.2�F to 4.7�F, and the output capacitor has also been increased...from 0.01�F to 0.1�F. These two changes will certainly increase the bass response of the circuit...but it may be too bassy for some players, depending upon their setup. The "level" pot has been changed from 500KA to 100KA to help remove some of the muddiness from the circuit. First off, I added a 1M pulldown resistor to the input of the circuit, which will prevent "pops" when using true bypass switching. The second change that I made was to replace the 100K resistor on the collector of Q2 with a 47K resistor. This helps tighten up the sound a bit, making it less "farty", and it helps to increase sustain. Third, I changed the 470-ohm resistor that's in series with the output capacitor with a 1K2 resistor. This helps to boost the output of the pedal so that I don't have to crank up the volume control so much. Fourth, I changed the 1KB "attack" pot to 2KB. This change doesn't really have any effect on the tone of the pedal, but it does help to prevent Q3 from becoming saturated. The Fifth change was to replace the 8K2 resistor on the emitter of Q3 with a 20K trimpot so that the collector voltage of Q3 can be adjusted to exactly 4.5V-5V. The sixth and final change that I made to the circuit is the addition of a 1N4001 reverse polarity protection diode. This isn't necessary but it helps to protect the circuit components in case the power supply is accidentally reversed or if the battery is touched to the battery snap backwards. Here are some pictures of the MindBender. Click the thumbnails for the full-size image (pictures updated November 3, 2004). Use your browser's "Back" button to return to this page.